From his birth, it was obvious that George H.W. 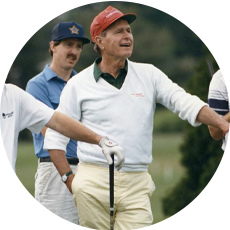 Bush was destined to be deeply involved in two things: politics and golf. His grandfather, George Herbert Walker, was president of the USGA in 1920. 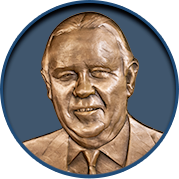 During his time at the helm, he created the Walker Cup, a biannual competition between amateur stars from the U.S. and United Kingdom. The Walker Cup remains today as one of amateur golf’s most beloved events. Bush’s father, Prescott Bush, was another avid golfer and also a president of the USGA before becoming a U.S. senator in 1952. Prescott Bush was an outstanding player, and an eight-time club champion at Cape Arundel Golf Club in Kennebunkport, Maine. "I do love the game." 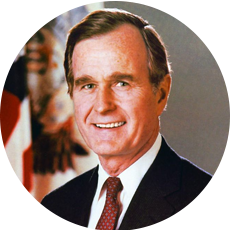 George Herbert Walker Bush was born in Milton, Mass., in 1924. 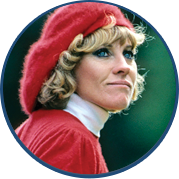 And it was at Cape Arundel GC that he grew up learning the game from his father and a man who would precede him both in office and in the World Golf Hall of Fame & Museum. Always interested in service, Bush joined the armed forces on his 18th birthday. He went on to become a pilot in the Navy, flying combat missions during World War II. Sports also remained a part of his life. Bush went on to become a scholar-athlete at Yale, captaining the baseball team. When Bush himself became the 41st president of the United States in 1989, he did not forget the lessons he learned on the golf course, or his love of the game. During his administration, he was an avid – albeit fast – player. George H.W. Bush was the original Honorary Chairman of The First Tee. 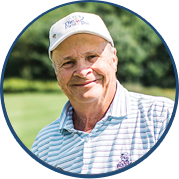 “You put your track shoes on when you’re playing with him,” said fellow World Golf Hall of Fame & Museum member Hale Irwin. After his presidency, Bush became even more involved with the game. 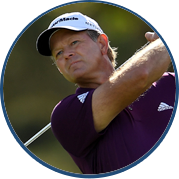 He was given the PGA of America Distinguished Service Award in 1997, the USGA’s 2008 Bob Jones Award and the PGA TOUR Lifetime Achievement Award in 2009. 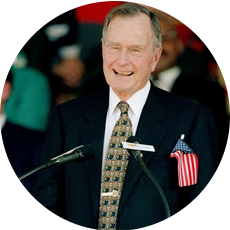 In 1996, Bush served as honorary chairman of The Presidents Cup and attended every one of the biennial competitions through 2009. 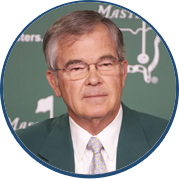 He is also an honorary member of the PGA and honorary chair of the USGA Museum and Archives President’s council. Bush was also on hand when PGA TOUR Commissioner announced the formation of The First Tee in 1997. 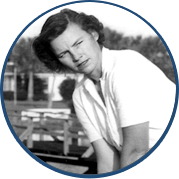 As The First Tee’s first honorary chairman, Bush presided over the organization as it expanded into one of the country’s most impressive, wide-ranging youth outreach programs. The First Tee reaches more than 4.7 million participants in 50 states and six international locations, as well as 120 U.S. military installations. And he has even carried on the family tradition of passing the game on. In 2011, he took on an emeritus role and passed the honorary chairman’s torch to his son, President George W. Bush. “I do love the game,” Bush said.